The Glenfinnan viaduct with the Jacobite steam train passing over. Our series of summer podcasts around the Highlands with local government reporter Susy Macaulay continues in Glenfinnan. Everyone knows Harry Potter is a global phenomenon, with 400 million of JK Rowling’s books sold and so far translated into 68 languages. Not to mention the films and their massive audiences. 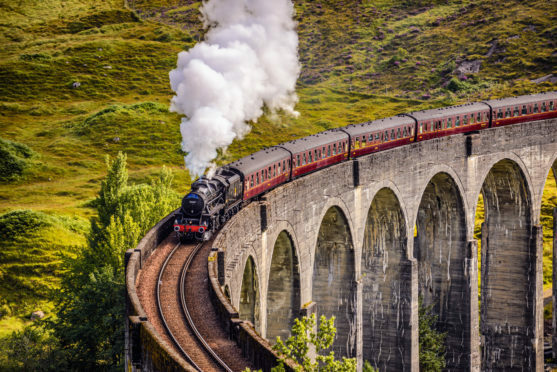 But spare a thought for a tiny Highland village which now finds itself daily overwhelmed by Harry Potter fans desperate to see the famous train and viaduct featured in the movies. PODCAST: As developers plan hundreds more homes in Nairn, can the town’s creaking infrastructure cope? The problem is, there’s nowhere for them to park, and precious few paths around a busy 60mph road to make their pilgrimage safe. Susy visited Glenfinnan to experience for herself the madness and mayhem of a village under siege and chats to stressed-out residents trying to find solutions. This is the second in a new series of podcasts from across the Highlands. Keep an eye on our website for the next episode. The ‘Harry Potter train’ approaches Glenfinnan station.